The East India Company was founded in 1600. The Company moved its London headquarters to Craven House in Leadenhall Street in 1648 on leasehold, and eventually purchased the building in 1710. East India House was reconstructed in the 1720s using the site of Craven House and neighbouring properties, and the new building designed by Theodore Jacobsen was finished in 1729. 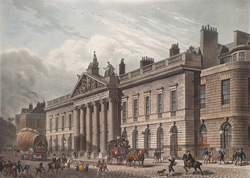 This picture represents the final reconstruction of East India House in the late 1790s with a new building on an extended site designed by Richard Jupp. A central portico of six ionic fluted columns supports a pediment decorated with sculptures representing His Majesty extending a shield over the commerce of the company. A statue of Britannia crowns the top, with a statue of Asia to the east and one of Europe to the west.